If you're getting ready to paint a wall in your home, chances are you will have some holes from hanging pictures and shelf brackets --- or cracks --- as well as ordinary wear and tear. 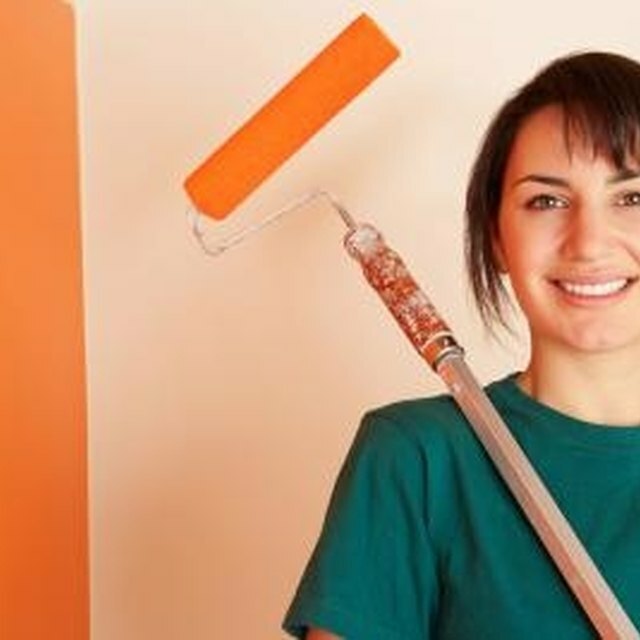 Before you apply a fresh coat of paint, repairing small imperfections takes only a few minutes. The procedure is easy and inexpensive, and will give your walls the unblemished surface they require for a good coat of paint. Filling in ordinary imperfections only takes a few minutes. Wipe down the wall, using a tack cloth or damp, clean rag to remove any dust and dirt. A tack cloth is a type of sticky material, often used in woodworking, that clears debris off surfaces. Smear premixed joint compound or Spackle over the imperfection, using a 6-inch putty knife. Add more joint compound than the indentation needs, because you will be smoothing it over an area larger than the size of the imperfection. Allow the compound to dry for several minutes. Sand down the joint compound with fine sandpaper until the surface is smooth, and then repeat Step 2 by applying a second coat. After the second coat dries, sand it down with fine sandpaper until it's smooth to the touch. Wipe the wall again with the tack cloth or damp cloth to remove any dried joint compound dust or Spackle. Fill any gaps where two surfaces meet, such as the space between your wall and the trim, with a silicone latex caulk. Wipe away the excess caulk with a clean, damp sponge, or sand off excess caulk if your walls are smooth. Wipe off the dried caulk and dust with a tack cloth or a clean, damp sponge. If your wall has some texture, rather than sanding, which will create a smooth spot on a textured wall, you can wipe off excess Spackle with a clean, damp sponge. Use premixed joint compound or Spackle when filling small holes from nails, chipped paint and dents. Large holes, such as those caused by a doorknob, will need to be patched with new drywall. The silicone latex caulk should clearly state on the label that it's paintable. If you've never done this before, you may want to use joint compound instead of Spackle. Spackle dries faster, which will force you to work faster and can lead to mistakes.